83.1B. Permission to Practice in a Particular Case. (1) Eligibility and Procedure. 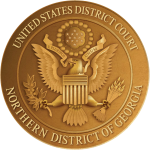 A non-resident attorney who is not an active member in good standing of the State Bar of Georgia, but who is a member in good standing of the bar of any United States court or of the highest court of any State must apply in writing for permission to appear pro hac vice in any case in which the attorney will appear in court on behalf of a party, apply for fees, sign his or her name to a document filed with the Court, or otherwise substantially participate in preparing or presenting a case. This requirement is not designed to require that every attorney within a law firm providing legal research, writing, or other services that may result in a portion of a fee request must or should be admitted pro hac vice so long as attorneys within the firm, who have appeared in the case, are directing that work, and such attorneys are either (1) admitted to the bar of this Court as regular members or (2) have been admitted pro hac vice in the case. Applications for admission pro hac vice may be obtained from the clerk. The applicant shall state under penalty of perjury the applicant's (1) residence address, (2) office address, telephone number and facsimile number, (3) the courts to which admitted to practice and the dates of admission, and (4) a statement that the applicant is in good standing and eligible to practice in all courts to which admitted. Applications for admission pro hac vice must be accompanied by payment of a prescribed admission fee. A non-resident attorney will not be permitted to appear until the applicant's application for admission pro hac vice has been signed by the district judge or, in cases in which the parties have consented to a magistrate judge presiding, the magistrate judge to whom the case is assigned. The presiding judge’s courtroom deputy may sign the application if so authorized by the district judge. (2) Designation and Duties of Local Counsel. An attorney applying to appear pro hac vice must also designate a local member of the bar of this court with whom the opposing counsel and the court may readily communicate regarding the conduct of the case and upon whom papers shall be served. The designated local counsel must sign all pleadings and other papers filed in the case by the attorney appearing pro hac vice. The address, telephone number, facsimile number and written consent of the designated local counsel must be filed with the attorney's pro hac vice application. If the non-resident attorney fails to respond to any order of the court for appearance or otherwise, the local attorney shall have the responsibility and full authority to act for and on behalf of the client in all proceedings in connection with the case, including hearings, pretrial conferences, and trial. Electronic Application: Applications for admission pro hac vice may be obtained using this link and must be filed electronically by designated local counsel. Payment must be made during the electronic filing of the completed application by the designated local counsel. Admission Fee: $150.00, payable by credit card, debit card, or ACH online through pay.gov. Designated Local Counsel: Must be an active member in good standing of the State Bar of Georgia and the Bar of the Northern District of Georgia and maintain an office and reside in the Northern District of Georgia. All attorneys signing as local counsel are subject to verification of enrollment and status of good standing with the State Bar of Georgia prior to application approval. Attorneys are reminded of their duty to verify the bar admission status of any attorney they are sponsoring. Provide all required information when creating your application, including a list of all cases filed in this court in which the applicant has appeared as counsel as well as local counsel's name and bar number. Save the completed application in PDF format, and e-file it in the appropriate case. Pay the $150.00 fee at time of filing. Once the order is signed granting admission pro hac vice, you must request access to the Northern District of Georgia’s electronic filing system through PACER. However, if filing access previously was granted in another case, you should omit this step. Click here for step-by-step instructions on requesting access to CM/ECF after you have been admitted pro hac vice. Exception: Attorneys who have been permitted to practice in multi-district litigation pending in the Northern District of Georgia without completing the standard pro hac vice application form may obtain access to the Court's CM/ECF system through PACER. An appearance must be filed in the case. Click here for step-by-step instructions on requesting MDL access to CM/ECF.